This message pretends to be an email message sent by a multifunction printer/scanner/fax machine as the result of scanning a document. 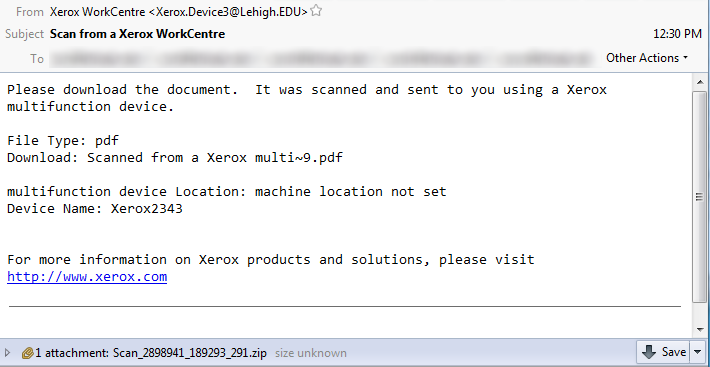 The message claims that the document is a PDF, but the attachment is actually a ZIP archive (note the extension at the end of the file name). The key principle here is that any message you weren't expecting should be regarded as suspect--if you didn't just scan a document, why would you be receiving this? If you aren't sure, don't click on any links or open any attachments. This particular mailing is an attempt to get you to open and execute an infected attachment. This email should be regarded as SPAM and deleted.